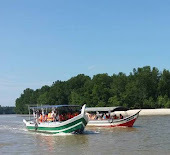 Boating from Kuala Sepetang to the area mention in the map below. 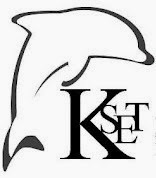 DOLPHIN sightings present a valuable opportunity to promote conservation efforts in the country, the Malaysian Nature Society (MNS) said. 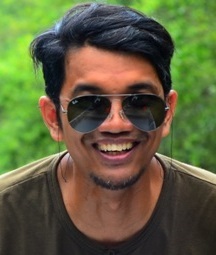 MNS head of communications Andrew Sebastian said dolphin sightings in Malaysia, common at coastal areas and river estuaries, are often celebrated events, which can help create greater awareness of the need to protect marine life. "After all, protecting our dolphins also means protecting their natural habitats -- ensuring the cleanliness of our waters and maintaining healthy ecosystems for them to survive," he said. 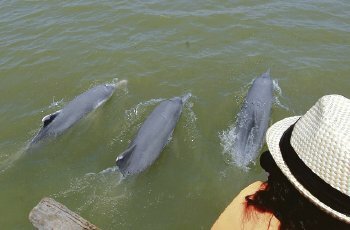 He said dolphin sightings could also help promote ecotourism, but cautioned that tourists should not expect to spot dolphins on every dolphin-spotting expedition. He said more studies on the behaviour of dolphins in local waters should be carried out so that the public can be properly educated on how to treat the marine mammals. "Fishermen or tourists sometimes do not know how to react or behave around dolphins when they encounter them, and this can create a dangerous situation." "Dolphins are sociable creatures but that does not mean their friendliness should be taken for granted," he said, adding that dolphins were classified as protected animals under the Wildlife Conservation Act 2010. 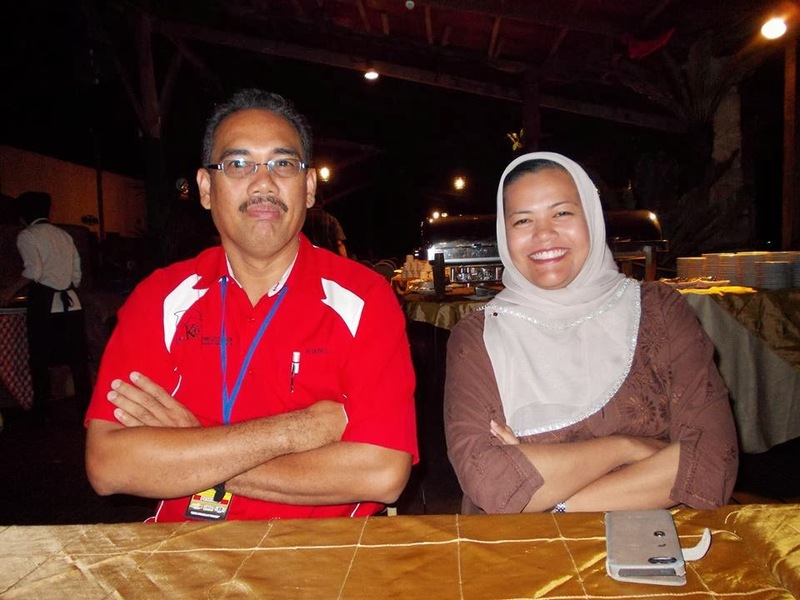 He said the MNS' Marine Mammal Project, an on-going study on marine mammal activities at the islands of Tioman, Redang and Langkawi, has already begun to improve knowledge on dolphin behaviour. 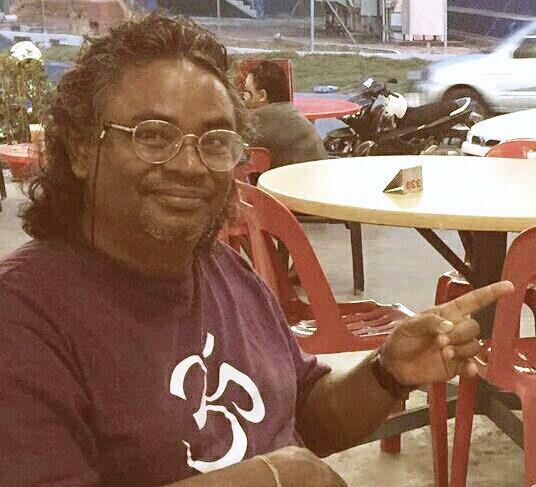 MNS president Professor Dr Maketab Mohamed said that about 20 species of dolphins have been recorded in Malaysian waters, most of which were found in mangrove and large river systems. "Their occurrence must be looked upon as a natural biological indicator and an opportunity to gain awareness, research and monitoring," he said. "Therefore, it is important for us to safeguard its habitat and manage our fisheries sustainably." 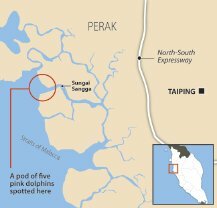 A marine biologist contacted by the New Straits Times said river dolphins were threatened with extinction as their preferred habitats -- estuaries -- were both ecologically sensitive and attracted heavy human activity. 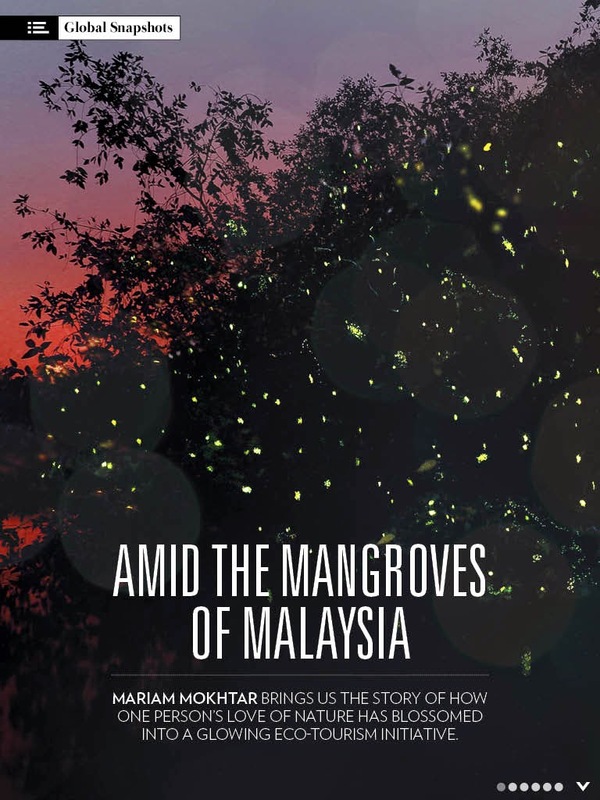 He said the group of pink dolphins, recently spotted at the Matang Mangrove Forest Reserve in Perak, could have come from either the Irrawady River in Myanmar or the Mekong River in Thailand where they have become increasingly rare. "I doubt there was a hidden population (in Matang) before -- dolphins are free-ranging oceanic species, which will happily travel to find an optimal environment." He said while the proper species of the Matang dolphins have yet to be identified, they were believed to be the Indo-Pacific humpback dolphin (Sousa chinensis chinensis), which are white or pink-skinned as adults, and can grow up to between 2m and 3.5m. 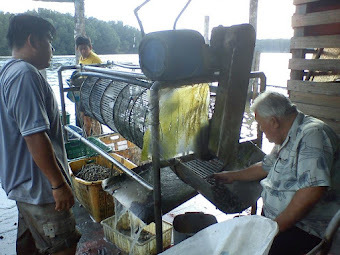 WHEN I arrived in the sleepy fishing village of Kuala Sepetang, near Taiping, I was buoyed with the hopes of being able to see dolphins up close. However, the locals in the area dashed those hopes when they told me that I might not be able to catch a glimpse of the dolphins. 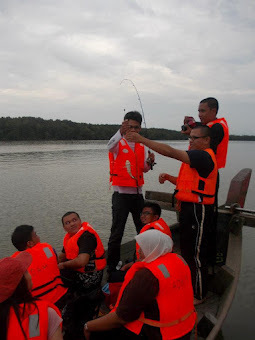 Still optimistic, I asked fishermen Muhammad Zamyr Affar, 19, and Mohd Safuan Shahidan, 19, for assistance, who agreed to take photographer Hasriyasyah Sabudin and I out in their fishing boat. 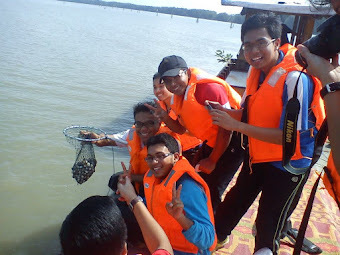 We set off from the Kuala Sepetang Eco-Education Centre jetty and headed for Kuala Sangga, a small Chinese fishing village located at the river mouth, about half an hour away by boat. 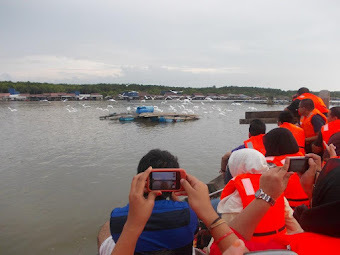 The dolphins, believed to be Indo-Pacific humpback dolphins (also known as Chinese white dolphins), are frequently spotted in the waters there, which is located within the Matang Mangrove Forest Reserve that stretches over 40,000ha across the state. At first, only brief flashes of fins and noses could be seen breaking the surface of the water from afar, but perhaps curiosity led the dolphins to come closer to our boat. Hasriyasyah and I had our work cut out for us, though, as we struggled to photograph the lively dolphins, which would come up for air for mere seconds before vanishing into the murky water. It was as though they were playing hide and seek with us as they appeared on one side of the boat, dove underwater and reappeared on the other side. 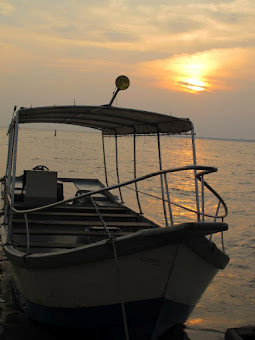 Sitting at the prow of the boat, I got a close-up view of the dolphins as they surfaced beside the boat, just within my reach, though I didn't dare to reach out and touch them. After an hour and a half of "playtime" with us, the pod of five dolphins began to tire and headed out to sea.